S.U.N. - Something Unto Nothing - S.U.N. 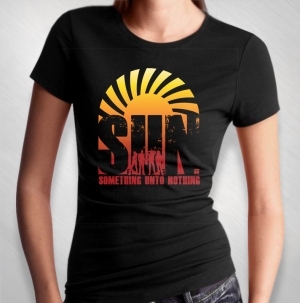 album cover printed on a black 100% cotton women's tee, in honor of the release of S.U.N. 's debut CD! The debut release from S.U.N. (Something Unto Nothing) CD, with Sass Jordan (vocals), Brian Tichy (guitar), Michael Devin (bass), and Tommy Stewart (drums). There are only a limited number of these shirt's, so get yours while supplies last! Check back soon for other specialty, limited edition items, as we will be adding items regularly!